SYMBOLISM OF THE EASTER RED EGG. Skopje, April 12 (MIA) - The dyeing of eggs in red for the Easter is the most popular custom among all of Christians. Dying of the eggs starts on Thursday before Easter, before the sunrise, when house women dye the first three eggs. "This tradition originates from the first century after Christ. The Easter egg is old as the Christianity," says Ratomir Grozdanovski, professor of the Theological Faculty in Skopje. He says the Church accepted the Easter egg as a symbol of Jesus' resurrection. The first Christians started to dye eggs and to present them for Easter, saying the phrase "Jesus has risen"! and receiving a respond "Truly he has risen". The red color is a symbol for victory, meaning that Jesus' resurrection has defeated the death. It also symbolizes the God's power and the blood he shed on the crucifixion cross for salvation of all people on the earth. According to the chronology of the Christ's events noted in the Testimonies, Holy Thursday is in memory of the Last Supper of Christ with his disciples. At the supper, He instituted the Holy Eucharist, consisted of bred and red wine, which are converted into the Body of Christ and into his blood. The holy Eucharist is a salvation for the people, and the red color symbolizing the Christ's blood from the holy Eucharist is the color of the Easter eggs as well. 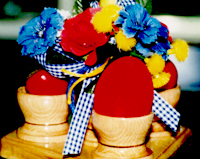 The red colored eggs on Holy Thursday symbolize that Easter is near just as Christ announced on the Last Supper that he would be soon betrayed. "According to the Holy Testimony Mary Magdalene was the first to start this custom of dyeing red eggs for Easter," Professor Grozdanovski explains the tradition of dyeing the eggs for Easter. Soon after the Christ's resurrection Mary Magdalene left Jerusalem in order to preach the testimony around the world. In Rome, the imperator Tiberius received her. She presented him with red egg and greeted him with the words: "Christ has risen." Afterwards she told him all about Christ, his preachment and his miracles. Following her example, the first Christians began to present themselves with red eggs on Easter, saying the phrase "Jesus has risen" - "Truly he has risen". The Orthodox Christians on Easter exchange Easter eggs with all their friends and relatives. Everyone "cracks" eggs and the person whose egg "survives" without breaking is supposed to have good luck. This custom symbolizes the Christ's resurrection and our salvation: the victory over the death. The customs expresses the faith in Christ's resurrection and the faith that one can rise from the dead. That is the hope for salvation and hope for the future. US TO KEEP ON SUPPORTING MACEDONIA. Macedonian President Boris Trajkovski met Thursday with US Secretary of State Colin Powell, who is paying an official visit to Macedonia. Macedonian Prime Minister Ljubcho Georgievski and Foreign Minister Srgjan Kerim also attended the meeting. "I have told Mr. Powell about my intention to include all political leaders, non-governmental organizations, religious organizations and citizens of Macedonia, i.e. the entire society in the political dialogue, making it transperent," Trajkovski said after the meeting, adding that Macedonia's society should give priority to induvidualism, and not of collectivism. "We want to built a society based on the individual rights and responsibilities," Trajkovski stressed. According to him , the US administration should devlop a coherent policy in regard to Macedonia and the region, and have active role in the region along with the European partners. Macedonia could relay on the political, economic and military US support, Powell said after the meeting. "You are facing a great challenge, to show to the region and the world that people with different ethnical origin may agree on peace through a political dialogue," Powell said. On the behalf of US President George Bush and American citizens, Powell expressed satisfaction with the beginning of political dialogie in Macedonia. He also handed over Bush's invitation to Trajkovski to pay an official visit to Washington on May 1-2. KERIM-POWEL: SUPPORT TO COMMITMENTS FOR BUILDING MULTI-ETHNIC SOCIETIES. At the joint press conference, Macedonian Minister Srdjan Kerim and US Secretary of State Colin Powel estimated the conference of ministers of foreign affairs from the Southeast European countries as very successful and constructive, which is supported by the joint conclusions of foreign ministers from Macedonia, Slovenia, Croatia, Bosnia and Herzegovina, Greece, Hungary, Bulgaria, Albania, Hungary, Romania and FR Yugoslavia. "The joint statement actually represents a summary of today's ministers' conference, and includes 11 points," Minister Kerim said. The participants at the meeting repeated their full support to the territorial integrity and sovereignty of the Republic of Macedonia, to the efforts undertaken by the Macedonian Government to respond proportionally to the violence, and its commitment for strengthening of inter-ethnic cooperation. They also stressed the importance of Macedonia's model of multi-ethnic society. The ministers also hailed the presence of US Secretary of State Colin Powel at the meeting, as prove for the engagements by the US in Southeast Europe. In addition the SEE ministers of foreign affairs hailed the decision passed yesterday by the Contact Group for former Yugoslavia in Paris and unanimously rejected the use of force as a tool for realization of political goals. They also repeated their full support to the UN Security Council's Resolutions 1244 and 1345 and expressed readiness for fulfillment of their obligations on international field, which includes cooperation with the International Court for War Crimes in former Yugoslavia from Hague. The SEE foreign ministers unanimously supported the Dayton Treaty and the rule of law in all parts of Bosnia and Herzegovina and stressed that minorities should not be a source of conflicts but a source of cooperation. The ministers also stood for enhanced cooperation through the Stability Pact for SEE as well as through the other regional initiatives. As Minister Kerim reported, at today's meeting the participants expressed commitment for more intensified cooperation in the struggle against the organized crime and corruption. "I am impressed by the commitments I've heard at today's conference regarding the respect for the law, condemn to the violence and struggle against corruption," US Secretary of State Colin Powel said. He positively evaluated Macedonia's activities for proportional use of force in the struggle against the terrorism and expressed satisfaction from the commitment of all participants for construction of stable economic and political institutions. He estimated his visit as very constructive and expressed satisfaction from the support given to the decisions passed yesterday by the Contact Group for former Yugoslavia in Paris. "I delivered the support from the US President George Bush and his administration to all ministers at the conference," Powel stated adding that the USA will provide economic and financial support to the countries from the region. The US Secretary of State said that the USA supports the political dialogue in Macedonia, which is supported by the invitation from the US President to Macedonian President Trajkovski to pay a visit to the USA on May 2d, 2001. "There are still terrorist structures in Macedonia that want to cause problems in the country, but I am pleased that the Macedonian authorities have started a dialogue which is successful, and I hope that the problems will be surpassed through that dialogue," he said, adding that the USA is ready to provide advices, but the Macedonian political subjects should deal with the problems in Macedonia. At the meeting with the Albanian representatives, Powel asked from them to show constructive attitude towards the dialogue. Minister Kerim said that Skopje-Washington relations are traditionally good, which is confirmed by today's visit of Mr. Powel. He stressed that Macedonia remains on its Euro-Atlantic orientation and commitment for construction of good multi-ethnic relations. He stated that the political dialogue represents a process of open talks between President Boris Trajkovski and political parties in Macedonia. 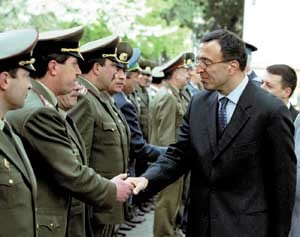 MACEDONIAN HIGH OFFICIALS MEET WITH COLIN POWELL. Macedonian President Boris Trajkovski, Prime Minister Ljubco Georgievski and Foreign Minister Srdjan Kerim met Thursday with US Secretary of State, Colin Powell. The friendly relations between Macedonia and the USA were once again confirmed in the long and cordial conversation they had. Colin Powell reaffirmed the political, economic and military support to Macedonia, and congratulated Macedonia on the manner in which it deals with the crisis the terrorist attacks on the Macedonian territorial integrity and sovereignty created. President Trajkovski and Prime Minister Georgievski briefed Powell on the current situation in Macedonia, and on the commitments of the Macedonian Governments to solve all problems through dialogue. Special attention was put on the intensified political dialogue led under the patronage of the Macedonian President. Trajkovski pointed out that the dialogue is opened to all structures of the society, and that the individual is put in focus in the dialogue, not the collective. 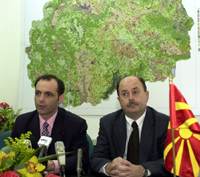 The Macedonian side pointed out to the need of additional international effort directed toward the complete fulfilment of the commitments of KFOR and UNMIK in Kosovo, in compliance with the UN Resolution 1244, because it must be done in order to prevent the possibility of Kosovo remaining a source of instability in the region. 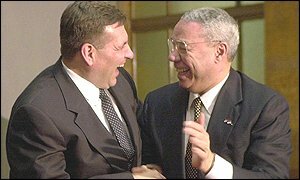 Colin Powell forwarded the US President's invitation for President Trajkovski to visit Washington on May 1-2 this year. US Secretary of State Colin Powell has separate meetings Thursday with the leaders of the Democratic Party of Albanians (DPA) and Party for Democratic Prosperity (PDP), Arben Xhaferi and Imer Imeri. Xhaferi briefed Powell on his party position about the necessity for changing of the Macedonian Constitution. According to him, the international factor may assist in surpassing of the crisis, but it may also provoke conflicts. Asked whether the terrorist would attack again if their demands were not met, Xhaferi said he did not agree with the thesis that "Kosovo is the source of all evils in Macedonia", adding that the crisis originated from Macedonia. "Reactivation of terrorists will not depend on the efforts of the Albanian parties, but on SDSM leader Branko Crvenkovki, Prime Minister Ljubcho Georgievski, as well as on a work of the Secretariat that is to be established," Xhaferi said. Imeri informed Powell about his party request for the international presence in the political dialogue. Powell promised to inform President Bush about the request. MACEDONIAN ASSEMBLY RATIFIES STABILIZATION AND ASSOCIATION AGREEMENT. Macedonian Assembly with unanimous votes "for" passed the Law on ratification of the Stabilization and Association Agreement between the Republic of Macedonia and the European Union. Macedonian President Boris Trajkovski, Macedonian Prime Minister Ljubcho Georgievski, the members of the Government as well as the heads of the foreign diplomatic missions accredited in Macedonia attended the session. The parliamentarians from the Party of Democratic Prosperity were also present at the session. Macedonian Foreign Minister Srgjan Kerim explained the necessity of the urgent passing of the Law and Macedonian Prime Minister Ljubcho Georgievski addressed the attendants. Macedonian Foreign Minister Srgjan Kerim said that is in the Macedonian interest to start the formal process of its integration in the European Union, grounded on the Stabilization and Association Agreement between Macedonia and the EU signed April 9, in Luxembourg. "We should urgently implement the Agreement in the Macedonian legislation", Kerim stressed adding that there is an announcement from the European Parliament that the Agreement would be ratified May 2. Macedonian Prime Minister Ljubcho Georgievski reminded that the historic event for Macedonia as a country and for its citizens took place only three days ago. "Europe, with an exceptional organization and great respect, showed how important Macedonia is for the further development of the European Union and for accomplishing the strategic goal - united Europe with unique political, security, economic and social framework of all Europeans," Georgievski said. According to him, with the ratification of the Stabilization and Association Agreement between Macedonia and the EU and its member states "we round the historical process, which clearly and undoubtedly determines the future of our country. It is the future that we chose by consensus. I am sure that we have chosen the right path. Macedonia will engage its full potential and with maximum rationality will use all its available resources, including the big support from the EU to speed up the reforms and to shorten the way to fully-fledged membership in the European Union," Macedonian Prime Minister stated. Georgievski quoted the statement of Swedish Foreign Minister Ana Lindh in Luxembourg, when she stated: "Welcome to the extended European family." "EU High Representative of Common Foreign and Security Policy Javier Solana repeated the same, stressing that the future of all the Macedonian citizens is in Europe and therefore Macedonia should have all its efforts oriented toward the political and economic integration in the European Union. EU Commissioner of economic relations Christopher Patten assessed the signing of the Agreement as a historical event for Macedonia, but also for the European Union. These statements confirm the consistent policy of the European Union toward Macedonia and the open support and help that Macedonia gains and would gain for sooner integration in the EU. Macedonian integration in EU is a clear and unanimous strategic interest and priority goal in the Macedonian policy. In the past ten years this interest and this goal were never questioned. Today, we can agree that we succeeded Macedonia to join the European family," Premier Georgievski said. "Certain conditions and criteria should be fulfilled in order to become fully-fledged member. The fulfillment will depend mostly on us, but we shall be supported by the European Union," Georgievski stated. "The Agreement should lead towards economic and political stability between Macedonia and the European Union. Our country is the first to sign an agreement with provisions from the field of justice and internal affairs. This comes out of the Amsterdam Agreement, which is in force since 1999, according to which the EU is in charge with this segment as well. The Agreement will define the types and the conditions of the financial cooperation, which will enable the realization of the obligations. As the last obligation of the Agreement comes the strengthening of the democracy and the multiethnic co-life in our country," Georgievski stated. In that respect, Macedonia should continue its affirmation as a multi ethnic country and as a country, where the minorities have equal rights and live according to the European standards. "Following the recent developments in Macedonia we continued and intensified the multi ethnic dialogue in order to resolve the crisis in democratic manner." He emphasized the fact that the European Union never doubted and never tried to cancel the signing of the agreement in Luxembourg. At the end of his address, Macedonian Prime Minister Ljubcho Georgievski stressed that the Agreement is a first step toward the Macedonian integration in the European Union. "With the agreement we successfully rounded up one phase and we opened enormous opportunity this generation to give its contribution for the next generations," Premier Georgievski stressed. DODOVSKI: WATER PROTECTION IS ONE OF MACEDONIAN GOVERNMENT'S TOP PRIORITIES. "The waters in this country, their protection and correct water supply management is one of the top priorities of the Macedonian Government" Macedonian Minister of Environment and Urban Planning Marjan Dodovski said on Thursday. Dodovski, at the press conference dedicated to the current activities of this Ministry, informed that on the its last session the Macedonian Government created a Crisis Staff that would follow the condition of waters in Macedonia, and suggest the necessary measures. Nikola Panovski, the State Secretary in the Ministry was also present at the press conference. "The Ministry of Environment and Urban Planning has prepared a Project for putting the Dojran Lake at the Ramzar list for protection of water habitats" Dodovski said. In this context, the Government adopted an Initiative for a project for saving the Dojran Lake, and created a Coordination Board for saving of the lake consisting of representatives from the competent ministries, local government and the Macedonian Parliament. The short-term aim of the project is to scoop water of the existing rivers in the area and redirect it in the Dojran Lake, as well to use the underground waters from the locality Gavacko Pole. The Ministry of Environment and Urban Planning provided funds for the initial activities of the Study for supplying additional quantities of water for the Dojran Lake from the locality Gavacko Pole. The part of the finances is from the Budget, and the rest of around DM 100,000 is a donation of UNESCO. Minister Dodovski also mentioned that Macedonia cooperates with Greece on this problem, and referred to the Memorandum for cooperation in the sphere of environment protection, which the competent ministries of both countries had signed last year. Dodovski informed about the joint Project of Macedonia and Albania for protection of the Ohrid Lake. He said that the Board examined the work on the project of the Macedonian team, while the Albanian side concentrated on the Pogradec project, and it asked for the project to be prolonged one more year. The priority of the Albanian Government is the building of collector system and a filter station in Pogradec. An organization board would be formed, consisting of the mayors of Ohrid, Struga and Pogradec and representatives from the Macedonian Ministry of Environment and Urban Planning and the Albanian Environment Agency, to organize the marking of the Day of the Ohrid Lake, June 21. The regional program for reconstruction of the environment in South East Europe, which was adopted at the informal meeting of environment ministers in Helsinki, July 1999, is an example of intensive cooperation of the countries in the region. A Macedonian delegation, led by Minister Dodovski, will participate at the ninth session of the UN Commission for Sustainable Development in New York on April 16-20, in order to review the development of the commitments from the Conference documents of the World Environment and Development Organization. The project for "Activities connected to biological diversity and evaluation of needs", financed by the World Bank, implies preparing of a National strategy for biological diversity, Action Plan for biological and landscape diversity, National Report that would be submitted at the meeting of the countries - members of the Biological Diversity Conference, and Clearing-house mechanisms. The World Bank allocated US $336,000 and Macedonia would participate with US $35,000. Yugoslav republics carve up gold hoard. AS COLIN POWELL, the American Secretary of State, began talks with other Contact Group Foreign Ministers on the threat of renewed conflict in the Balkans, the six republics of the former Yugoslavia announced rare agreement on a long-standing quarrel: how to split up the former federations holdings of gold. An announcement from Belgrade said that after almost ten years of talks, rump Yugoslavia had agreed with the four breakaway republics on the division of 46 tonnes of gold held in the Bank for International Settlements in Basle, Switzerland. The agreement is a big step towards resolving the long dispute over a general division of the former communist countrys assets. Dobrosav Mitrovic, head of the Yugoslav delegation that represents Serbia and Montenegro, said that all republics had agreed the proportion of the gold allocated to each one. Its total value is estimated at nearly $440 million (£306 milion) and the money will be vital in helping Serbia to recover from the devastating Kosovo conflict. The gold will be divided according to a formula suggested by the International Monetary Fund. This will give 36.52 per cent to the present Yugoslavia, 28.49 per cent to Croatia, 16.39 per cent to Slovenia, 13.2 per cent to Bosnia and 5.4 per cent to Macedonia. Belgrade had claimed that it was the sole heir to the former federation and the former President Milosevic had insisted on retaining all the assets. Only with his overthrow did any movement come in the negotiations. President Kostunica agreed that the gold should be divided roughly according to the former republics wealth and population. The European Central Bank, which also attempted to mediate, had proposed a bigger share to Bosnia and Macedonia, the two poorest republics, and this led to a new breakdown in talks in December. The two countries have still to ratify the new division. Meanwhile in Paris, Mr Powell and Igor Ivanov, the Russian Foreign Minister, joined four West European Foreign Ministers at the first meeting of the Contact Group since September to look at the outbreaks of violence now threatening Kosovo, Macedonia and Bosnia. They are expected to issue a strong warning to Albanian extremists in Kosovo to halt infiltration and attacks on the Macedonian and Serbian borders, and to offer political and military support to Skopje. America signed an agreement with Macedonia yesterday granting $3.5 million military aid. Macedonia successfully repelled incursions last month by armed Albanians who took over border villages. Robin Cook, the Foreign Secretary, flew to Paris yesterday afternoon for a meeting to focus on a recent flare-up in Mostar, where Bosnian Croats have been rioting. US boost for Balkan stability. Boris Trajkovski and Colin Powell - full backing. US Secretary of State Colin Powell has pledged his support for a multi-ethnic Macedonia on his first official visit to the Balkans. "You are facing a challenge which you must meet," he said after talks with both ethnic Macedonians and Albanians. "That is to show to the rest of this region - to show to the world - that people of different background, different ethnicities, can come together in peace and find the way to resolve differences through political dialogue and a common commitment to a single state." Last month the Macedonian army clashed with ethnic Albanian rebels demanding greater rights for the Albanian population. After meeting Macedonian President Boris Trajkovski, Mr Powell pledged political, economic and military backing. "You can be sure of American support for your efforts," he said, damping fears that the United States would play a minimal role in the region under the Bush administration. On Wednesday, Mr Powell told his European allies that the US intended to remain in the Balkans. "There is no end point - we have established no time by which US troops have to be out." Mr Powell said Washington was reviewing the level of troops needed in the region. "We're constantly looking at the mix, and participate in the regular reviews of the size of the forces, and looking for opportunities to draw down but not for opportunities to bail out." Macedonia has a majority Macedonian Slav population and a minority Albanian community. The Albanians are demanding constitutional changes to give them a greater say, but the government fears such a move would lead to the break-up of the multi-ethnic state. The BBC's Nick Thorpe says there is much speculation that long-running talks between the two sides are about to lead to a new coalition government. He says both Macedonians and Albanians are keen to include the Americans in their diplomacy. On Wednesday Foreign Minister Srdjan Kerim said one of the main goals was to have an ethnically mixed university in the north-western town of Tetevo by October. The town, mainly inhabited by Albanians, was the scene of heavy clashes in March. The town has had an Albanian-language based university since 1994, the only one in the country. But it has never been recognised by the government. More difficult sticking points are Albanian demands for better representation in the administration and the police, the decentralisation of power and the creation of an Albanian-language television channel. The Albanians' main demand is more recognition in the constitution, which currently calls the former Yugoslav republic a country of the Macedonians, and lists Albanians as a minority along with Turks, Roma gypsies and other groups including ethnic Serbs and Bulgarians. Mr Powell is visiting Kosovo and Bosnia on Friday. U.S. Secretary of State Colin Powell (R) hugs Macedonian President Boris Trajkovski before their meeting in Skopje. SKOPJE, Apr 12, 2001 -- (Agence France Presse) U.S. Secretary of State Colin Powell flies into Macedonia Thursday hoping to persuade ethnic leaders to damp down tensions that last month flared into open warfare between Macedonian forces and ethnic Albanian gunmen. Macedonia, which received Western support in February and March for their fight against ethnic Albanian guerrillas, is hoping the international community will become more engaged in the struggle to stabilize the country. Powell stressed the determination of President George W. Bush's administration to maintain a presence in the restive region Wednesday during a Paris meeting of the six-nation Contact Group for the former Yugoslavia. "It was important for me to be here as a sign of the commitment of the Bush administration to the Balkans and to our mutual efforts in the Balkans," he said. Both the Macedonian government and the main ethnic Albanian parties in Skopje will petition Powell for added U.S. support. The government wants Washington to back the European Union's firm commitment to stability in the region, to stave off the risk of what Foreign Minister Srdjan Kerim called the "Balkans virus" of shifting frontiers and ethnic unrest. And Arben Xhaferi, the leader of the main ethnic Albanian party which is a member of the coalition, said he would ask Powell to step up pressure on the government to address key ethnic issues, accusing Skopje of skirting round the edges of the core problems. He said the "main generator of the crisis" was the constitution, which names Albanians as a minority rather than a nation along with Macedonian Slavs. Skopje refuses to change the document for fear that it could lead to federalization and the break-up of the multi-ethnic state. "I will ask the U.S. to be more involved in the case of Macedonia, which is a kind of geo-strategic pillar in the heart of the Balkans, connected to Albania, Greece, Bulgaria, Kosovo and Serbia. Any conflict here can provoke a much larger conflict," Xhaferi said. Powell's visit comes at a "particularly important time" for Macedonia and the Balkans, said Kerim Wednesday. At the end of March the government declared victory over the rebels after weeks of fighting, and followed up its military victory on Monday by signing an EU Stabilization and Association Agreement, a first step to EU membership. The EU said further progress was conditional on Skopje meeting European standards in rights and democracy. Macedonian officials have declared the constitution off-limits and any talks are likely to focus on increasing opportunities for Albanians in education and employment, as well as a greater role in the police and civil service. But the Albanians' main push is for a change to the preamble of the constitution, which calls the former Yugoslav republic a country of the Macedonians and lists Albanians as a minority along with Turks, Roma and other groups including ethnic Serbs and Bulgarians. Skopje says that ethnic Albanians make up around a quarter of the population, while the Albanians say they constitute at least a third of the country's two million people. Macedonia is a member of NATO's Partnership for Peace program, a halfway-house for former communist countries seeking full membership of the alliance. Last month Skopje ordered in the army to deal with the ethnic Albanian guerrillas who had fought special police to a standstill on the edge of the northwestern town of Tetovo. The army then swept through rebel bases in villages along the northern border with Kosovo, routing the gunmen and claiming to have stamped out the insurrection at the end of March. Skopje said the guerrillas were mostly veterans of neighboring Kosovo's own 1998-99 war against Belgrade. OSCE Mulls Monitoring Bulgaria's June Election. SOFIA, Apr 12, 2001 -- (Reuters) The Organization for Security and Cooperation in Europe (OSCE) said on Thursday it would consider monitoring Bulgaria's June 17 general election after opposition parties expressed fears the poll could be rigged. "Our organization will decide on the question by the end of next week," OSCE Ambassador Charles Magee told reporters at the end of a five-day visit meeting state officials. 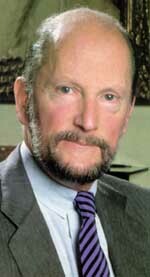 "No one has expressed any objections to sending an OSCE mission for the election," Magee said. The election is seen as close contest between the reformist Union of Democratic Forces (UDF) and opposition Socialists. An emerging third force set up by exiled King Simeon II last week and the ethnic Turk Movement for Rights and Freedoms (MRF) are also seen as strong players in the race. "We requested that the elections be monitored by OSCE observers to guarantee that they are fair and transparent. We fear that if there are any violations, the image of Bulgaria will be tarnished," said MRF deputy Yunal Lyutfi. The ruling center-right UDF said they saw no risks for the election after 11 years of democracy and said the OSCE were welcome to come. UDF's cabinet led by Ivan Kostov is the first to complete a full four-year term after the collapse of communism in 1989. Greece Stops Bulgarians at Promahon Check-Point. Over 60 Bulgarians were not allowed to enter the Republic of Greece in the last two days. With no explanations the Greek authorities were returning Bulgarian nationals with regular passports and the required sum of GRD 5,000 per day. Most of those who were denied entry to our Southern neighbor have filed the complaints with the chief of the Koulata check-point. They will be sent to the Foreign ministry, the border policemen explained. Yesterday morning the Greeks didn't let through a van with Plovdiv plates too. Despite the fact that the passengers declared and presented the required money, they were told, without any explanation, that they wouldn't be let to cross the border. The problems started the very first day of the lifting the visa restrictions for the Bulgarians some travelers said who were trying to cross the border from Tuesday at Promahon check-point. The local authorities declared that not every Bulgarian, despite his wishes, was entitled to visit Greece. "We could think of 2006 as a realistic date for Bulgaria to enter the EU", Czar Simeon II said. According to Czar Simeon II, 2006 would be a realistic date for Bulgaria to enter the European Union. He said this in an interview for the France Press that he gave today. Commenting whether an eventual invitation to Bulgaria to enter the NATO in 2002 would have a positive effect, he said that he would welcome eventual joining the NATO, although one should also think realistically as for economic preparedness of the country for such a move. Simeon II: The Problem of Abdication Does Not Exist. - You declared your resolve to enter politics. Did you bid goodbye to the king's idea? - There exist other priorities over which our fellow-countrymen are more concerned. - I don't have any concrete answer. The question is beyond the context of what concerns most of our fellow countrymen. - Our exile is something rather sad and very hard to bear if one wants to do it with dignity. Particularly so if one bears the name of Bulgaria. - Will you take part in the parliamentary elections? - I'll tell you when the time comes. - You say, some changes in the political system are needed. What are they? - Everyone could ask himself about it. For example, let's talk about ethics, morality, transparency. Let's talk more about Bulgaria and the interests that unite us and let's not leave a stone unturned in search of what divides us. - According to what mechanism will you single out the people? - If possible, according to morality, competence, according to whether they are liked by the people whom they are to represent. - How do you plan to monitor your nominees? - We live in a democracy. Speaking about monitoring sounds a bit strange. I believe that if a given individual proves he does not meet the criteria for which he has been elected and if he has disappointed the electorate, it is not loyal for him to remain or move to another group. And not to ask his electorate whether they agree with him. - When will you announce the names of the people you'll work with? - I'll stick to the law and the envisaged dates. Naturally, it will be before May 2. Bulgaria Is State of Penury. Birth rate drops, mortality rate ups. The growth varies from minus 4 to minus 11 percent. 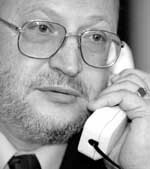 This leads to high rate of ageing, says Alexander Hadzhyiski, chairman of the National Institute of Statistics (NIS). He was the 23rd guest in the column 'Dialogue Standart'. On Tuesday for more than one hour Mr Hadzhyiski was in the editorial office of the 'Standart' daily and answered your questions. The chief of the National Statistics Institute Alexander Hadzhiiski was born in the already non-existing village of Gorni Passarel which is at the bottom of the 'Iskar' dam near Sofia. He graduated in geodesy from the Higher Civil Engineering Institute - the now University of Architecture, Civil Engineering and Geodesy. He worked at the Bulgarian Academy of Sciences, occupying himself exclusively with statistics. He was a MP. He is married with a child. His daughter is a historian. - How much were the expenses for the census? - In the previous year we spent 1.8 mln levs on its preparation. This year the expenses were 19.5 mln. Some 25 mln levs will be the total costs of the whole census. Half of the money are for paying the wages of the counters and inspectors. All of them worked in very precarious situation. - Does poverty of population transpire from the census data? - The rate of poverty is high. We'll have a very precise picture of the unemployment, as far as this is a very important issue for Bulgaria. Every quarter we carry out researches, but they are not of such a range. - The Bulgarian population is ageing. Is the statistics able to forecast the age factors of the Bulgarian citizens in the next 20-30 years? - This is one of the few fields where the statistics forecasts, since no one can do it. Actually, the population is ageing. Its structure is also changing. It's a fact, that now there are 1,000 males per 1,050 females. The reason is that the average life expectancy of the females is longer. Birth rates are falling and those of mortality are rising. The growth ranges from minus 4 to minus 11 percent. This leads to high rates of ageing. Besides, the population under 18 years of age now amounts to 1.5 million. In comparison with 1992 young people decreased by 438,000. This is due to a great extent to emigration. The total population number shrunk by 510,000 persons and 340,000 of them are due to the negative growth and 170,000 - to the emigration. - Why does it come that there often are differences between the inflation rates announced by the NSI and the ones shown by the trade unions? - This is a myth. I declare with an entire responsibility that in Bulgaria no other institution is able to calculate the inflation but NIS. It is beyond the abilities of any other organization to carry out 32,000 surveys in 5,000 shops, to examine 6,000 households in this complicated situation. Our activity is under the close control of IMF and the World Bank. So far I haven't heard any official criticism. It is only the trade unions who do that. But usually they do not voice data of their own. To avoid our 'monopoly', all kinds of probabilities, including public council as well are envisaged in the new Law on Statistics.